Celebrate the big day between Prince Harry & Meghan Markle with this beautiful commemorative mug. The design shows off the Royal procession and carriage with bystanders waving the flags of Great Britain and the USA. 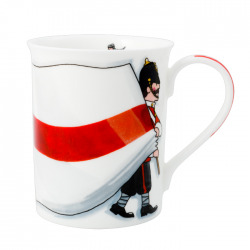 Is there a better way to drink your morning cuppa? Each mug is hand-made in Stoke-on-Trent, the home of pottery, using traditional methods which have been perfected over 100's of years. 22 carat gold around the rim gives this mug that extra special touch.